Home » Xero Custom Templates – Available NOW! 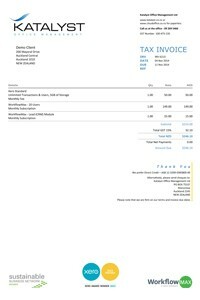 Xero Custom Templates were included in the major Xero upgrade this morning. These include an invoice, statement and credit note. They look awesome and you can do all sorts of format and placement changes on them, including large back ground images. If you have different more than one income stream in your business, each with their own branding, you can have different Xero Custom Templates for each one. For example, a Plumber might have a plumbing team and a separate gas fitting team. With the Custom Template, you can now have different themes for each. You can completely change the layout, logos and payment details. Need help with Xero Custom Templates? We can build custom templates for you – see our Custom Templates page for more information. We also have pre-built templates which you can customise available from our Xero Shop. The custom templates use a Word docx format, you will need Word 2010 or greater. Consider using PDF compatible fonts for a consistent result. For more information about Xero custom templates, or WorkflowMax custom templates, contact us now.